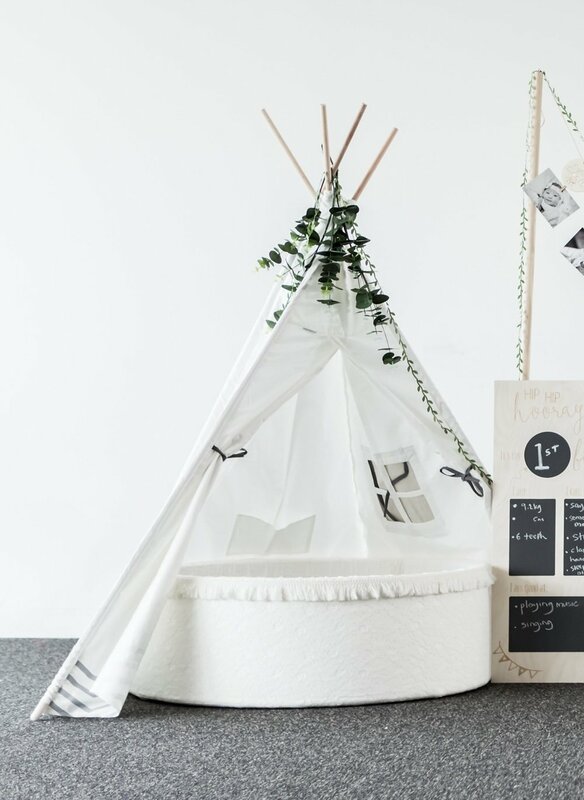 This teepee is such a beautiful yet versatile accessory item. It goes well as a backdrop for your ball pit; add some comfy cushions to make it a reading area, or turn it into a unique gift area where guests can drop off presents. This teepee is made out of high quality durable canvas. It is all white with grey chevron on the bottom. The play tent is bigger than the teepee and is suitable for larger parties. This play tent is a great little hiding enclosure for multiple kids to explore and play in, and it also can be used as a gift area for parties. This play tent can also be paired up with your own cot-sized mattress for a comfortable seating area or sleepover party for your little ones. The birthday board is a great way to display your child's milestones at their birthday party. Take a picture with your little one next to the birthday board with their milestones to create memories for years to come. Insert your child's name in the chalkboard circle and write down all of their milestones for the year. Suitable for all ages. This 12 month birthday banner is the perfect addition for any first birthday party! It comes with 12 x wooden circle boards with a clip attached at the bottom for you to insert your baby's photo from 1 month - 12 months. The banner also comes with a standing pole for display so you won't need to worry about attaching it to any walls! Have older toddlers to entertain at your party? These jumbo ice blocks will be a great addition to your package! Let them go wild with their imaginative play! From stacking to building to knocking, these stylish jumbo ice blocks will sure keep those busy toddlers and kids entertained in the party.